? Sync your tasks with Google Tasks.
? 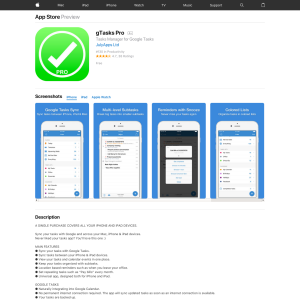 Sync tasks between your iPhone & iPad devices.
? View your tasks and calendar events in one place.
? Keep your tasks organized with subtasks.
? Location based reminders such as when you leave your office.
? Set repeating tasks such as “Pay bills” every month.
? Universal app, designed both for iPhone and iPad.
? Naturally integrating into Google Calendar.
? No permanent internet connection required. The app will sync updated tasks as soon as an internet connection is available.
? Your tasks are backed up.
? Manage your tasks conveniently on your home/office PC, and have them synced to your iPhone/iPad and vice versa.
? Share tasks with your colleagues.